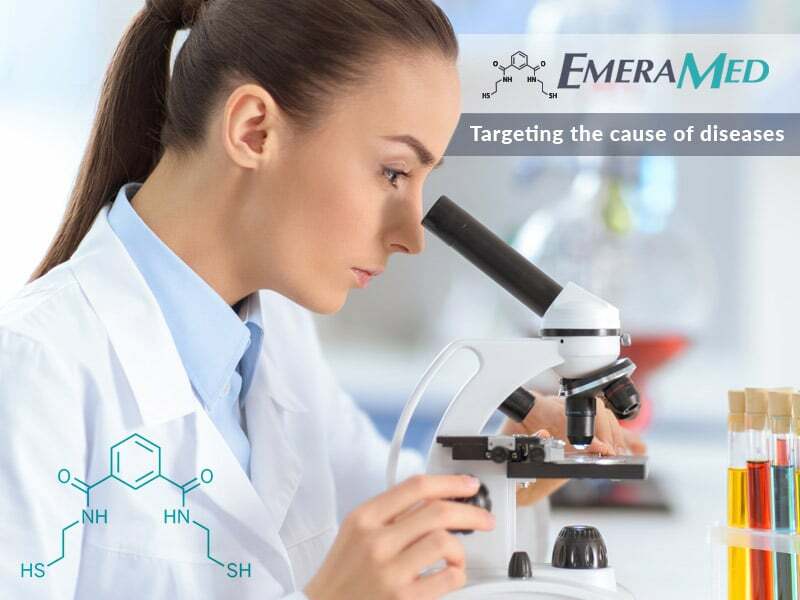 EmeraMed Ltd is a biotechnology firm developing the lipophilic, blood-brain-barrier passing metal chelator and antioxidant Irminix®. EmeraMed: Targeting the cause of diseases. Oxidative stress releases free radicals and is a major part of all illnesses. Irminix® captures free radicals, which are unstable molecules that can damage the cells in your body. Additionally Irminix® captures the heavy metals mercury and iron which helps create free radicals and thereby helps restore normal function to the mitochondria and overall health. COPD: A Phase 2a clinical trial has been completed in summer of 2018 and found Irminix® to be safe with no adverse effects. Mercury poisoning: Orphan Drug Designation has been granted for the prevention and treatment of mercury toxicity in the EU and USA. Phase 1 and Phase 2a clinical studies have been performed and found Irminix® to be effective and safe with no adverse effects. Other conditions: Preclinical studies are ongoing for several other indications.